I know some of us are in the midst of doing a Whole30 right now, but this review and giveaway is overdue. So, if you’re like me, just wait on these until you complete your Whole30, and know you have something delightful to look forward to! Have you heard of Coco-Roons? If not, you are missing out. Seriously, these things are da bomb. So many flavors, so much yummy goodness! I was lucky enough to be able to taste test all the flavors: Lemon Pie, Brownie, Cacao Nib, Vanilla Maple, Apple Pie and Almond & Strawberry “PB&J.” Sound amazing, right? What makes them even more amazing is that they are raw, and have minimal ingredients. They’re made mostly from almond flour and coconut, and use pure maple syrup as the sweetener! Just click on the flavor names above to see the ingredients of each flavor. I’m gonna start with my favorite: Lemon Pie. Do any of you remember Lemon Coolers? I remember eating them as a kid…they were kinda like vanilla wafers, but with white powder on them, and they were lemon. Man, they were so good. These remind me of them. Superman’s favorite was the Almond & Strawberry “PB&J.” He said, “It’s like biting into a PB&J sandwich!” Honestly, these weren’t my favorite, but this just goes to show you how much people’s tastes can differ, because he ate the whole bag. I gave some of the brownie ones to my friends, and they all couldn’t believe they were actually “healthy!” Chocolatey and moist, they said. The Cacao Nib Coco-Roons had nice subtle bits of chocolate, and everyone I gave them to loved them as well. Vanilla Maple was my second favorite, and seemed to be the most popular when I shared with friends. I think the name itself pretty much makes it impossible not to like them. And lastly, Apple Pie. This one wasn’t one of my favorites, but again, Superman likes them. As you can see, we are quite the opposite in many things. I guess that’s why we’re so good together. Looking for a retailer near you? Check out THIS link to see where Coco-Roons is sold in your area. And of course, we have a giveaway! 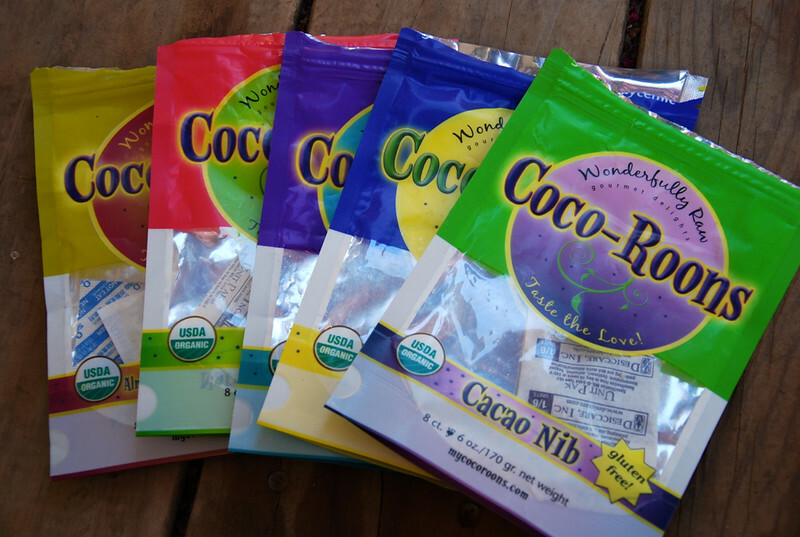 Coco-Roons will be giving away a t-shirt and 3 free bags of Coco-Roons to one of you! Want to enter? Click on the Rafflecopter link below. You must go through this link if you want your entries to count, as I have no way of keeping track otherwise! Disclaimer: Coco-Roons provided me with a free sample of this product in exchange for a review. I was not under any obligation to write a positive review or sponsor a product giveaway in return for the free product. Mmmmm… I think I’d pick the Brownie ones! I would probably try the brownie one! Sara, I just updated the post with a link–thank you for asking! oh…do I really have to pick just ONE to try?!?!? I guess I would probably start with the Lemon Pie or the Vanilla Maple ones…they both sound YUMMY!!! The vanilla maple sounds divine! I meant to say.. I would like to try them all!! Thanks for letting me know–I’ll see what’s up! I am sort of torn between the PB&J and the Brownie ones. I love both things so much and am always hopeful of finding a Delicious alternative to eat since I have cut out the bad stuff. If I had to choose probably would go with Brownie, chocolate Yumm!!!!! Anything chocolate would be nice! I would definitely choose the brownie ones!Wait, or definitely the vanilla maple… or… well, they all sound good! Oh yum! Brownie and Cacao Nib sound delicious! These are outstanding! I love the Vanilla Maple! Lemon Meringue Pie used to be a favorite – so lemon is at the top of my list to try!!! I love vanilla (and maple) so I would try that one first. They sound amazing but I bet no-one in the UK sells them. These are my treat over here, guess you guys may not have heard of them http://www.naturalbalancefoods.co.uk/nakd-fruit-and-nut-bars/ but they are really nice. Raw foods, unsweetened, mainly dates and nuts. The Caffe Mocha are my favourite, along with pecan pie and gingerbread. I think they all sound great! Lemon Pie, Brownie, Cacao Nib, Almond Strawberry PB&J would be the ones I’d want to try for sure. The chocolate flavors sound like they’d give me that little fix I often need, and I’m trying to eat more raw cacao. Brownie or Cocoa Nib. Yum! mmmmm! cooconut and mmmmmm chocolate!!!! love!! I would choose the Lemon, the Brownie and maybe the Vanilla Maple… excuse me while I go look up where to buy them while I wait to win them! I love Coco-Roons! If I win (and I soooo hope I do), I would pick your favorites– Lemon Pie, Vanilla Maple, and Cacao Nib (which I have had before and love). Sounds yummy – I’d love to try vanilla maple or apple pie! I would love the cacao nib or brownie. Actually all of them sound fantastic. Thanks for the support and tell all your friend. Hi love your site. Never tried coco roons but would so love to win some. They all sound great! I love anything vanilla so pair it with maple and it just has to be my first choice to try! These sound so yummy! I would try the vanilla maple, cacao nib, or lemon pie! Cocao nib, almond&strawberry or lemon pie! Ive only tried the Maple Vanilla which are divine! I’d love to try the PB&J…I think superman and I might have the same taste! Would love to send giveaway to the winner. Could you please email me name and address of the winner.!!!!! !